There were only a few items in my grocery basket so, when the cashier asked me for $100, I insisted on seeing the receipt. There it was, a single loaf of ordinary brown bread – no seeds, nothing fancy – listed at $7.50. There had to be a mistake, I thought, walking the loaf to the returns department of a Kauai K-Mart. But no, I was told. That was the price. A loaf that would cost $1.99 anywhere else in the United States was $7.50 on the island of Kauai. We’d come as a family to enjoy a week in the December sunshine of the tropical island and learned quickly it would be anything but an inexpensive vacation. Our first shock was when we’d tried to book a furnished house or flat, thinking it would be a perfect way to avoid the cost of eating out every day. We checked the usual sites: vrbo and airbnb, and the listings showed beautiful accommodations, close to the beach and within our budget. So we booked air and went back to the website to secure a place to stay. That’s when we discovered that all those listings were controlled by agencies and, though they appeared “available” online, when you actually tried to book them, you discovered they weren’t. 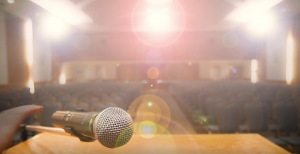 The “hard sell” began the moment I called the agencies. “There’s nothing left on the island,” the agents would say by way of introduction. Then, after a moment’s pause … “All I have left is this apartment at $350 per night.” Pictures of said apartments showed rooms last updated in the 1970s, tiny places that looked entirely unappealing. We learned visitors to Kauai book their accommodation up to a year ahead, sometimes more. And they pay premium prices for their island sunshine. After many hours scouring online we found accommodation at a modest three-star resort, where we crammed four people into a tiny room and filled the excuse-for-a-refrigerator with snacks, lunch and breakfast foods. Still, the mostly lousy dinners we were forced to eat in restaurants, dining on food that was consistently overpriced, were memorable only for their pitiful quality. Kauai Vacation Lesson 1: Book early, ensure you have a kitchen, then visit Costco in Lihue and stock up. 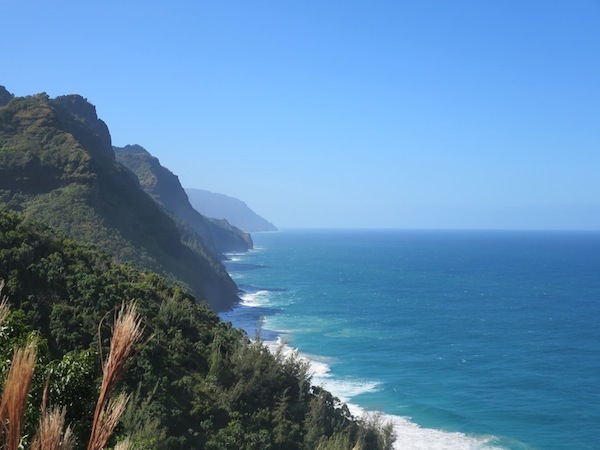 Price sticker-shock aside, we were quickly bowled over by Kauai’s lush beauty. Drive around the island and there are exquisite beaches around every corner, the palm tree-lined stretches of sand you see in brochures, lapped by warm water that makes swimming pure pleasure. We had brought boogie boards and snorkel gear, and spent our days exploring beaches on different parts of the island. In Poipu, which has the island’s busiest beach, we snorkeled over the shallow reefs, while in Port Allen we marveled at a massive monk seal, stretched in languid repose on the shore. In Wailua, the kids surfed for hours, riding small-but-strong waves onto the beach before venturing back for more. In Princeville, we watched a massive turtle swim leisurely, oblivious to the swimmers and snorkelers nearby. With sunscreen and a picnic lunch in hand, the hours spun by beneath the Hawaiian sun, a perfect tonic after the grey, cold winter back home. 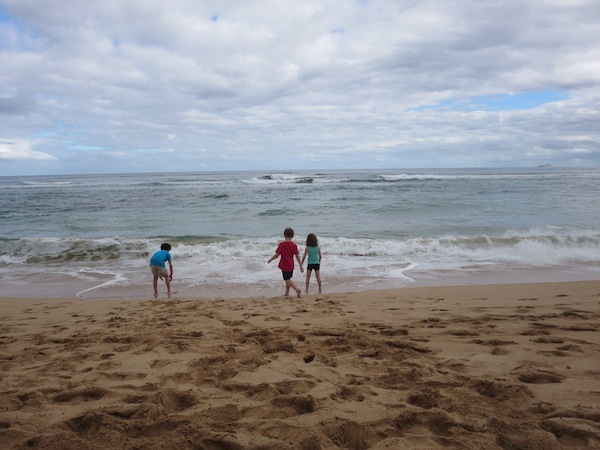 Kauai Vacation Lesson 2: The beach is all you really need. “You have to see Waimea Canyon,” folks told us. We had good intentions of visiting the “Grand Canyon of Kauai” but when we started out and learned it would be close to two hours each way, four kids fighting in the back seat, the canyon felt a whole lot less appealing. Instead, we contented ourselves with a hike up Nounou Mountain, through a forest of Norfolk pines with ringed trunks that felt straight out of a fairytale. The hike was exhilarating and muddy, taking us past locals’ back yards, where orange trees hung heavy with ripe fruit. Never has fruit theft felt more appealing – though we kept our hands to ourselves. Later, at one of Kauai’s farmers markets, we had ample opportunity for tasters. We purchased $5 coconuts from a young man who wielded a machete and expertly sliced them so we could drink the sweet milk before devouring the soft interior. And we gratefully accepted samples of colorful rambutan, miniature apple-bananas, massive avocados and Kauai-made chocolate spreads, jams and honey. There’s a farmers market somewhere on the island every day of the week and when you find one, it’s a great opportunity to interact with locals and stock up on fresh local fruit and vegetables. Just don’t even think about bringing them home. Produce export is strictly monitored at the airport and we even witnessed the confiscation of a small container of peeled mango someone had tried to save for the flight. The only time we opted for a group excursion with a local tourism vendor, we wished afterwards that we hadn’t. The kayak tour we took mentioned a paddle upriver and snorkeling in a secluded cove. What it didn’t mention was that the river was very unremarkable, and that we’d need to commute an hour each way to reach the excursion. The disappointing outing robbed us of a precious day on one of the island’s better beaches and our dinner later that night, at a Hanalei restaurant, represented a new low in our island eating experience. Kauai Vacation Lesson 3: Rent a car, buy a guidebook and explore on your own. Lauren Kramer, an award-winning writer and editor, lives in Richmond, B.C. To read her work online, visit laurenkramer.net.